We’re now entering the time of the year when waste is produced at an increased rate. The holiday season brings with it happy memories and the opportunity to spend time with friends and loved ones. But many families are left with a significant amount of waste in their home once the holidays conclude. Our Ontario bulk trash removal team at Junk Works has great experience in managing home waste challenges and we’ll help you to reduce your waste this holiday season with this comprehensive guide. One common error many families make during the holiday season is to use a fake plastic tree in their home to celebrate. These plastic trees then end up in landfills across the country, leaching chemicals into the local environment. Take a step towards protecting the environment this season by using a real tree. The real tree doesn’t have to be a long-term maintenance issue. There are now multiple companies across the country offering mulching services that turn the tree into mulch to be used again in the months ahead. You might wish to cook a large meal for your family and friends. But now’s the time to consider how best to optimize your use of food during the meal.Studies show that the average North American wastes well over 200 pounds of food per year. But with your holiday feast offering you a number of opportunities to combine leftovers, you should hone your food waste reduction plan. For example, you might plan to make turkey sandwiches in the days ahead, and buy stock for turkey soups. You can’t always decide how your Christmas cards are dealt with after you’ve presented them to the recipient, but you can ensure they have the option of recycling the cards when the holiday season has concluded. Companies throughout the industry are now manufacturing their Christmas cards with recycled materials, ensuring it’s easier to recycle the product once it has been used. About 1.3 billion cards are sent each holiday season in North America, meaning that committing to recycling can now make a significant difference in the environment across the continent. Another mistake many of us make is not considering how our gifts might impact the environment once we’ve presented them. You might buy that new toy and present it to the child of a friend without giving the toy’s wrapping a second thought. But you can actively reduce your negative impact on the environment by considering the type of gifts you give and the packing included with them. For example, instead of giving plastic consumables as gifts, consider swapping an item you already own or offering your expertise as a gift. 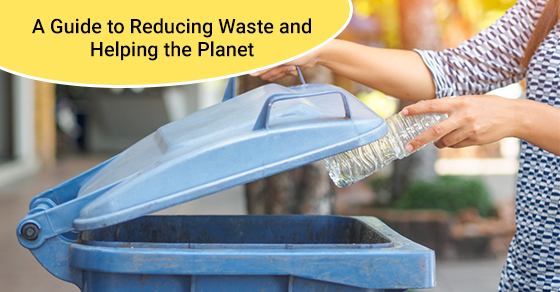 This can help you avoid contributing to local environmental issues and ensure your environmentally-conscious approach is seen and utilized by others. We receive them every year—those unwanted gifts that are offered with a nice thought, but have little value to us in the months ahead. Often, you might simply place the gift in the garage or even throw it away if you really don’t have any use for it. But there are other options for ensuring that unwanted gifts are used as the giver intended. Why not donate your unwanted gifts to a local charity? Charities across the country are now accepting toy donations and other types of donations to help support their organization and make others in the community happy this holiday season. It’s far more simple to use for some, but disposable plates and cutlery are generally produced from materials that are damaging to the planet. For example, plastic knives and forks can contain elements that cause environmental degradation in the long term. To limit your impact on the environment, try to make sure you’re using non-disposable plates and cutlery. Using ceramic or metal plates can help to ensure you’re not adding to the number of disposable items at junk yards across the country. Our Ontario-based bulk trash removal team are available around the clock to remove those older, out-of-use items from your property. We employ trusted professionals who have decades of experience in the junk waste removal marketplace, and this means our team can complete their work quickly and within industry-leading turnaround times. It’s a trusted service designed to help your family save money on junk removal for the years to come. You can rent a dumpster directly from our team at Junk Works when you’re ready to clean your home. We’re known for offering the highest quality dumpsters for use outside your property. One of the benefits of our self-service dumpster rental service is its convenience. You can call us at any time throughout the day to come pick up the dumpster and we’ll have a team over to you in a short timeframe. We understand it’s not always easy to know how to remove items from your home in the most environmentally-friendly way possible, and that’s why we’re here to answer your questions and provide guidance. We are experts in environmentally-friendly trash removal strategies and we can answer any questions you might have about this process. Our experienced team is waiting to help guide you through the junk removal process around your home. To discover more about ways to reduce waste and protect your local environment this holiday season, please call our team today. This entry was posted in Environmental Tips on December 19, 2018 by Junk King. Last updated April 4, 2019 .